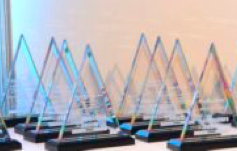 On April 10, Lakesight Technologies was presented with awards for its Tattile, Chromasens and Mikrotron brand cameras at the Fourth Annual Vision Systems Design Innovators Awards presentation, held during The Vision Show in Boston, MA. The three winning Lakesight Technologies cameras — the Tattile S12MP Smart Camera, Chromasens 3DPIXA 3D Color camera, and Mikrotron EoSens® 3FIBER cameras — were recognized by a panel of esteemed experts from system integrator and end-user companies. “Lakesight Technologies is honored to be recognized by its industry peers with Vision Systems Design Innovation Awards for these three groundbreaking, exemplary cameras,” said Peter Tix, Chief Executive Officer, Lakesight Technologies. “Tattile, Mikrotron and Chromasens embody the competitive spirit which drives both the machine vision industry and the world of automation and digitalization forward.” Lakesight Technologies is a machine vision platform aimed at building a European leader in the industry through organic growth and acquisitions. For more information, please visit http://www.mikrotron.de.